Check out this great speech by Bill Whittle, at the Restoration Weekend 2012 in Palm Beach, Florida in November. He talks about what’s wrong with the Republican party, why they lost the election, how a true president should act, why capitalism is so great, and some differences between conservatives and liberals. Quick – put on your shocked face! Utah coal mine lays off 102 workers over Obama’s war on coal! Obama Shuts Down 1.6M Acres to Oil Shale Development! Papa John’s to Cut Workers’ Hours over Obamacare! Layoff bomb joined by hiring freeze! Debt ceiling to be raised by 2.4 Trillion at the end of the year! ‘Innocence of Muslims’ filmmaker sentenced to a year in prison for ‘parole violation’! New report released: Foodstamps surge to an all time high! Looks like somebody finally gets to discover the answer to the question: Exactly how many virgins does Allah give you when you get to heaven? It may be too soon to look at this in terms of political impact… but this will definitely give Obama a bump with moderates and conservatives… for a while. The media is currently portraying the president as not only a decisive commander in chief, they’re practically putting him in the compound pulling the trigger on Osama! Like I said, this will help him out with his poll numbers. Oddly, the people who love him the most are the ones who won’t be impressed at what was accomplished. The left abhors the war on terror, any display of American force, and our military in general. So this won’t win him any points with his disenfranchised base. I’m home here, sick as a dog, but we desperately needed to go get some groceries. I shoveled the driveway as best I could manage, and we were able to plow the car out into the street, slipping and sliding all the way through our development out to the main road. It was then that Sue reminded me that she wanted to go to the bookstore for a chance to meet someone pretty interesting. 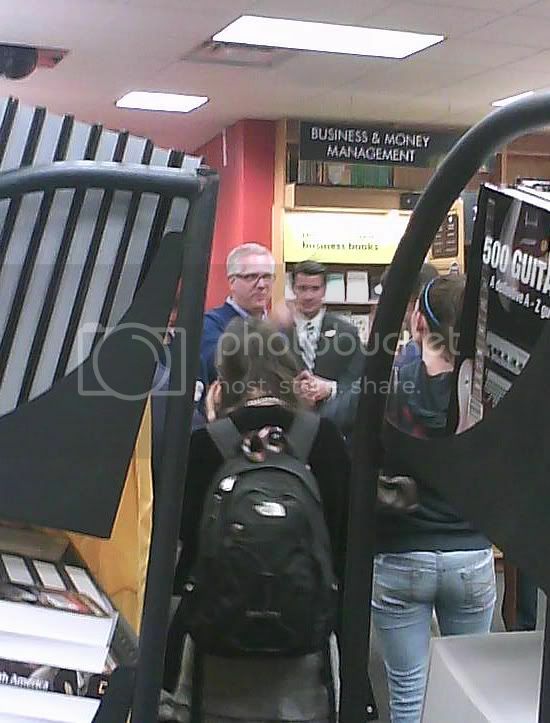 Turns out Glenn Beck was going to be at our local Border’s bookstore today signing copies of his new book, “Broke”. 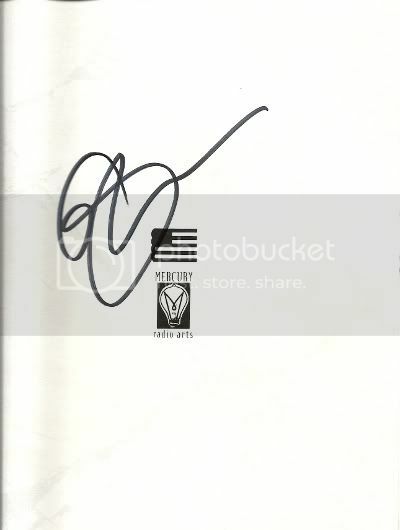 So, as ridiculous as I looked, I decided to head on over there: The plan was that Sue would go in and buy a copy and then stand in line while I was in the car with the sleeping kids, and once she got the signed copy, I’d head in there (hopefully before he left) and steal a glance at the guy. As I walked in, I noticed around 50-60 people huddled around the back of the building. Sure enough, there was Glenn Beck with a police officer and 2-3 book-tour assistants. He was in a blue comfy looking sweater. It was kinda unreal to see him IRL. “5 minutes, everyone,” one of the assistants nervously chirped. “5 minutes until Glenn has to leave!” Nuts, I thought. Might as well try. Another gentleman was commenting on how they could have handled this better, using a limited number of books (150-200) at the desk Glenn stood at, and just tell everyone “sorry” once they ran out. I responded that, although that sounded like a good idea, I’ve never actually ran one of these events, and I’m sure there are logistical issues with that approach as well. The line went surprisingly fast. I thought for sure, “Any second now one of those nervous-looking little assistants is going to announce to us that ‘GLENN BECK HAS LEFT THE BUILDING.” To my astonishment, I finally reached near the front of the line. One of the assistants came up to me and asked to see my book. I asked him if he needed to see my receipt, but he said, “no.” He opened it to one of the inner pages, and as I got even closer, another gentleman took my book and handed it to Glenn. I haven’t listened to Glenn as much as I have some of the other conservative pundits (Mark Levin, Rush, Hannity, etc. ), but I do appreciate that he tries to interweave a spiritual message in with his conservative rhetoric. He’s a Mormon, but I don’t get the gist that he’s trying to lead Americans to Mormonism, but just a traditional American faith in God. And that’s a better than 99.9% of the celebrities in this nation (the man even said “God bless you,’ to someone after me in line). He describes himself as a “Rodeo Clown.” I could say the same thing about myself when I’m in a crowd, always going for the laugh. I don’t think he’ll be able to turn America around, but I believe he’s genuine, and would truly like to see that happen. I can admire that. The last thing in the world I want is some bored, underpaid government flunkie groping my wife and children while I stand by idly awaiting my turn. Or having grotesque scans of them leaked out to the internet. I am seriously considering not flying again until this garbage ceases (thankfully I have no travel plans in the immediate future). Regardless, this is an extreme violation of the privacy and dignity of all travelers. How much more must we sacrifice at the altar of political correctness before we start properly identifying our enemies? Subjecting nuns and children to the same examination techniques used on suspected criminals says an awful lot about how our government views its own citizenry. Can we not find a better way? I can almost hear the raucous laughter bellowing out from caves deep beneath the mountains of Afghanistan. Apparently, San Fran Nancy Pelosi is going to attempt to stay on as Minority leader in the house. As she IS the most toxic personality in America today (even more than GW), this is great news for conservatives everywhere, as she will continue to attach herself to (and drag down) the liberal agenda. It’s not quite awesome enough for the “happy days are here again” song, but it is a minor cause for celebration. I hereby present… the FINAL FANTASY VICTORY COCKATIEL! happy days are… well. hmm. I was all prepared to re-post my “happy days are here again” youtube clip again. Republicans swept the House, as expected. 65+ seats. That’s great news. A much-deserved farewell to San Fran Nan as speaker of the house. The bad news is: Joe Miller may lose to Princess Murkowski in Alaska, Barbara Boxer still has a job, and, the most bitter pill of all… Harry Reid is still the Senate Majority Leader. 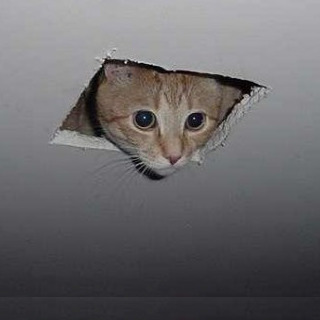 Ceiling cat is watching you legislate. Don’t think the American people put you back in power to go back to business as usual. We don’t want compromise. This is not about you, it’s about conservatism. You’d better cowboy-up and get to work rolling back the damage the democrats have done, or next election cycle… you’ll be the ones facing the tidal wave. 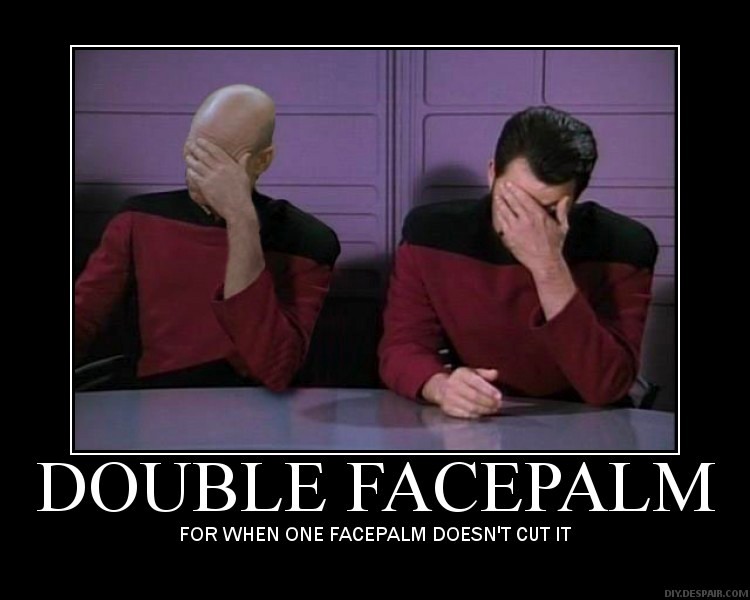 Ugh, I just remembered… this means Joy Behar and Karl Rove victory laps today. Not looking forward to that. Pentecostal pastor Terry Jones of Louisiana is planning on spending three hours throwing Korans (the “Bible” of Muslims) on a bonfire this Saturday evening. Now, I have zero respect for the Koran, as it is not a holy book. Anyone who claims to be a Christian, must believe that Jesus Christ is the way, the truth, and the life. The only way, truth, and life. Therefore, the Koran is a false book written by a false prophet. That’s my personal conviction. I’m sure that all true Muslims feel the same way about the New Testament, and most of the Old Testament. A little quid-pro-quo, I suppose. However, in the presence of a Muslim (or anyone for that matter), no matter how ridiculous I thought it was, I would not insult the thing they cherish most, out of respect for them. I would hope for the same in return. Oddly, America is selectively offended by this. Nobody in the media or government cries when a Bible is spit upon. Burned. Its pages used as toilet paper by blasphemers. These displays, no matter how antagonistic, after all, are protected under freedom of speech. Everyone from Hillary to Obama to the Vatican have weighed in and condemned the book BBQ as “hateful,” “despicable,” “dangerous to our troops,” etc. etc. Fortunately for many people, Christians don’t threaten to murder folks who disrespect us or our beliefs, even when those acts wounds us deeply in spirit. With the encroachment of the Ground-Zero mosque, and living under a government that constantly bends over backwards (… or bows) to avoid offending Muslims, I can understand this man’s frustration, and see what has driven him to this point. This is definitely not going to engender peace with any man, and it will probably cause a smearing of Christ’s name in many, many circles, as retribution for this act. Now, sometimes, God causes his men to do things that are offensive to shock the people from their deep slumber. The Old Testament is full of such examples. But any man can claim to have done something because “God told him to.” I hope this pastor reconsiders. Not, as a coward, for fear of Muslim reprisal. But because this is not, I believe, an accurate enactment of God’s will. Really? That’s it? No names? Dates? Places? FACTS? We’re just making stuff up now? There are liberal websites who are RUNNING with the quotes from this article like it’s the gospel. I can understand not liking someone on the other side of the political spectrum, and trying to convince folks on their side to jump ship. But, can we at least pretend to verify our smears before we publish them in a nationally-read magazine? For crying out loud. 1. He maintains that he is a Christian. 2. He did not attend a mosque. He attended a “christian“ church (bolded quotes thanks to you, Rev. Wright). 3. He is probably sympathetic to Islam because that’s what his dad (who refused to raise him) was, which makes him appear to lean (bow?) their direction too often, causing suspicion. 4. He doesn’t have time to pray to Mecca five times per day (too busy playing golf? :). WE INTERRUPT THIS BLOG POST TO BRING YOU A SPECIAL BULLETIN! One time, I met this one guy who knew a lady who heard from a kid that may have (at some time in his/her life) lived in Chicago that Obama has a secret mosque built underground in his backyard! Unfortunately, I can’t tell you who the kid is, when he told me, or bother to verify whether or not there actually is even room for a mosque in his backyard. But now you know the TRUTH OBAMA IS A SECRET MOOOOOOOSLIM! Vote Republican. See, I can be a “journalist,” too. I think that having children has greatly affected my political choices. Once you realize that, every time you say “gimme gimme gimme, take all the freedoms you want but gimme stuff Mr. Government!” that you’re actually stealing from the next generation (or, in a parent’s case, your own children), you begin to look at things differently. You’re robbing them of their tax dollars, their liberty, and, ultimately, their future. As is always the case as a parent, you eventually put aside your selfish needs and wants and are compelled to do things with their benefit weighted above your own. So, two more reasons I’m a conservative: Silas and Brianna.